Become your own BOSS – join the growing health & wellness industry for FREE! Unlimited earning potential, freedom to work the hours you want and training & support to guide you every step of the way. There’s no limit to what you can earn with Mannatech. Start small and work your way to more. You decide. Over 200 Associates have made more than $1M with us. Enjoy the freedom to fit your business into your personal needs. Work the hours you want, wherever you want. Join a global network of people empowered to run their own successful business. We’ll support you every step of the way. Fill in the form. Once your FREE sign up is complete, we will send you your Welcome Kit and Bonus Product. Once you sign up you will have access to your backoffice, where you will have access to marketing tools and reports to keep your business on track. 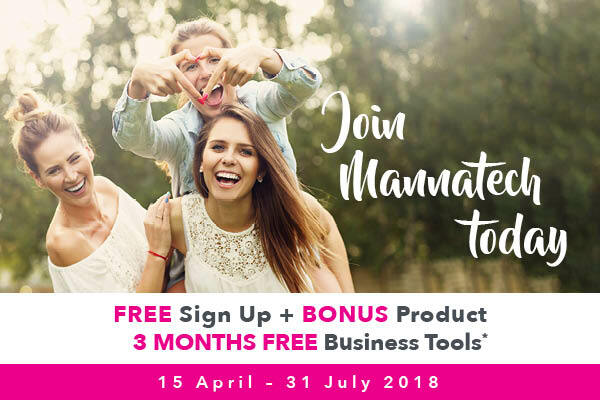 * Receive a FREE SIGN UP and BONUS PRODUCT (PLUS) when you purchase 150PV or more between 15 Apr – 31 Jul 2018. * This offer applies only once for NEW Associates. Existing Associates are not eligible to participate in this offer. * Welcome Kit Valued at AU$49.95 / NZ$55.00 / SG$55.00; BONUS PLUS Valued at AU$55.00 / NZ$60.50 / SG$62.00.